Four years have passed since Dan’s wife passed away and Dan has not found another person to love. Things change while on vacation with his family in Rhode Island when Dan meets a woman named Marie at the local bookstore. Sparks fly immediately and Dan is in love. Unfortunately for Dan, Marie is Dan’s brother’s girlfriend. Now Dan and Marie must figure out whether or not to tell the family about their encounter or keep it secret and try to get along for the remainder of their stay. Steve Carell’s portrayal of Dan is perfect. With emotions ranging from being in love to having his heart broken, Steve delivers on every occasion. If you’ve never seen Steve Carell in anything except his hit TV show The Office then you owe it to yourself to watch Dan in Real Life. You’ll be pleasantly surprised by Steve’s ability as a serious actor. Supporting Steve Carell are Juliette Binoche as Marie and Dane Cook as Mitch, Dan’s brother. The film is complemented by a superb soundtrack with songs written and performed by Sondre Lerche. The film was directed by Peter Hedges who’s previous work includes Pieces of April and About a Boy (written by). As far as the Blu-ray itself, it is presented in 1080p/AVC MPEG-4 with a resolution of 1.78:1. The transfer is well done with only a few scenes where film grain is noticeable. Outdoor scenes are beautifully rendered with bright colors and no artifacts. Sound specs include: English 5.1 Uncompressed (48 kHz/24-bit), English and French 5.1 and Spanish 2.0 Dolby Digital. Included on the disc are tons of extras including: audio commentary with director Peter Hedges, a making of/behind-the-scenes featurette, making of the soundtrack, deleted scenes and a bunch of funny outtakes. 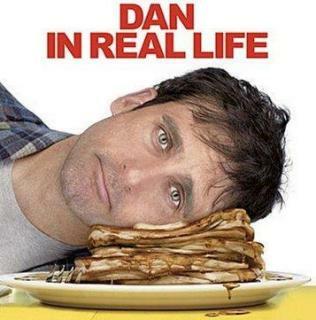 Overall, Dan in Real Life is a sweet and honest film that doesn’t attempt to be something it isn’t. What is Dan in Real Life? It’s exactly that. The story of a man having to deal with life. The story of a lonely man raising three daughters, trying to find love again. Does Dan succeed and get the girl in the end? I’ll let you find out for yourself, but what does succeed is Dan in Real Life – a fun yet heart-wrenching film grounded in an all-too-recognizable location that we too want to escape sometimes – real life.